The Romans used great public projects to make their empire the most advanced of the ancient world. The Romans particularly excelled at building roads. The roads made it easier the Romans to travel, move troops, collect taxes and trade with faraway provinces. The expression, “All Roads Lead To Rome" refers to the fact that Rome was the center of the ancient civilized world. Many of the roads, bridges and aqueducts of ancient Rome are still used today. 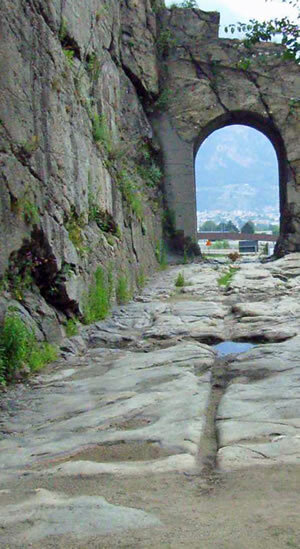 Roman engineers brought water into the city by building water bridges called aqueducts. 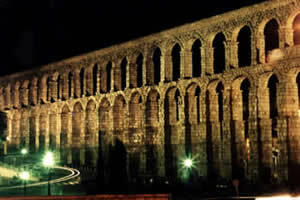 Nine aqueducts provided the Roman people with 38 million gallons of water every day. Parts of the ancient Roman aqueduct system still supply water to fountains in Rome. The Romans built many huge stadiums called amphitheaters. People would gather in amphitheaters to watch shows with clowns, jugglers and acrobats. Some Roman entertainment was cruel. People would watch fights between wild animals and gladiators. Gladiators were usually slaves or criminals who fought with swords against animals or one another. A skillful gladiator might win his freedom by defeating an opponent. More often, the gladiators lost their lives. The greatest Roman amphitheater, the Colosseum, still dominates the Roman skyline. Only a portion of the Colosseum remains standing. Earthquakes destroyed some of the structure. Some of the stone used to build St. Peter’s Basilica came from the Colosseum. St. Peter’s Basilica is the church in the Vatican where the Pope resides. Perhaps the greatest Roman engineering achievement was their sewer system. Rome, being set in a valley among seven hills, presented a sanitation problem — there is nowhere for dirty water to go. Sewers solved this problem and made it possible for Rome to become the most populated city of the ancient world. At the height of the empire, the population of the city swelled to more than one million people. Roman aqueducts transported water from the countryside to cities and towns. 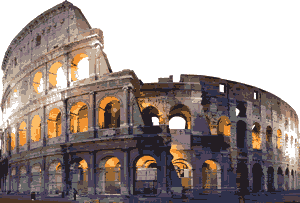 The Roman Colosseum was completed in 80CE. A portion of the amphitheater remains standing today. Many Roman roads are still passable more than two thousand years after their construction. 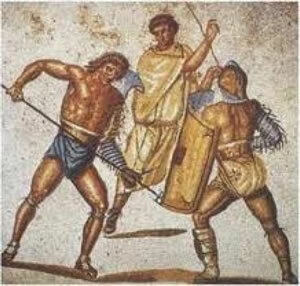 Gladiators entertained Roman audiences by participating in violent confrontations with other gladiators and wild animals.